The month is starting out on a difficult note for me. Yesterday I received a call from my vet with the results of Maddie's blood and urine test. They indicated that her kidneys were failing. So today I took her back to the vet for more tests and to get an x-ray to check for kidney stones or a tumor. She has neither, which means the kidney failure is due to aging. She will be 12 on October 21st. They told me her kidneys are functioning at 1/4 or less of what is normal. Evidently, kidney disease can make the animal nauseated or cause an upset stomach, which would be the cause of her lack of interest in food and consequential weight loss. So she will now be taking an anti-acid every day and she will be on a special diet. Hopefully, these will slow the progress of the disease. The other significant health problem she has is a heart murmur that will eventually (which could be a quick overnight change) cause her heart to enlarge and fluid to back up in her lungs. So she is also on a daily dose of heart medication in hopes of slowing the effects of the heart disease. When you have a pet, you know the chances are you will outlive them unless you are rather older yourself. But there is no way to prepare yourself to let go. I confess that even the thought of having to say goodbye to my sweet little baby crushes my heart. I have to take her back to the vet in three weeks and they will recheck all the levels. If they have gone down, she has a chance of living a bit longer. That is my prayer. She is the best little dog I have ever had - sweet to the core - and my house would be incredibly empty without her. Not to mention my heart. Maddie on "border patrol" (patrolling the perimeter of her yard). I appreciate the concern of those who have sent a note about Maddie. She is eating better! She actually ate both her breakfast and almost all of her dinner yesterday, which is twice the food she had been consuming recently. She also got fairly spunky last night and wanted to play. This consists of her carrying one of her stuffed toys in her mouth as she runs a circle around the love seat and living room chair, staying just far enough ahead of me that I can't catch her. It makes me dizzy, so I can only chase her for about 15 laps before I collapse on the floor. We played this game way too many times last night! You know how you can be in the middle of a situation that is awful, one that is just gut-wrenching, yet in a wee little part of your brain, you realize how totally ridiculous you must look, should anyone be watching? I find myself in these situations often, for some reason. And one of them occurred the day before I had to take Maddie back to the vet for more tests. One of the things they wanted me to do was to obtain a urine sample. Maybe it's just me, but I don't routinely keep containers on hand for this purpose. So after I get off the phone, I start looking through all of the plastic throw-away containers I have, hoping to find one that will be useful. Hmm. I found margarine containers, a Cool Whip container and a container that held the Pistachio nuts I bought around Christmas time. None looked particularly ideal - or even close to ideal. I decided to start with the nut container. It was taller than I had hoped, but it was the smallest in diameter. I placed it on the table by the back door. The thing about Maddie is, when someone goes to the back door, even if their only intention was to look outside or open a window that is in near proximity, she believes this is her cue that it's time to go out. So, no sooner than I sat the "specimen jar" down and turned around, there she was, jumping up and down, begging me to let her outside. I retrieved the container quickly and out we went! The next problem became evident fairly quickly. Dogs don't stay in one place long. Using the "facilities" to them means taking a full tour of the yard. One second they're sniffing and the next...well, you get the idea. So I found myself rushing along behind Maddie, trying to stay close enough to thrust the container under her when she started to pee. This proved to be an interruption she did NOT appreciate! Every time she squatted, I tried to slip my jar beneath her quickly and silently. But she KNEW and responded by instantly stopping the flow and propelling herself 10 feet beyond my reach, where she turned around to glared at me as though I was the nut who belonged in that container! After 20 minutes of this, by which time both of us had grown tired of the routine, I gave up and left her to make her rounds alone. I glanced at the two or three little dribbles I had managed to catch and knew I was in for a long afternoon. The next round, I decided to try the Cool Whip container. It was lower and the height had certainly been a problem during my first attempts. So even though it was bigger around, I thought it would work better than the plastic nut jar. Ha! Schnauzers don't like wide things thrust under them when they are trying to pee any more than they like tall things! I sensed I was making Maddie paranoid after the 10th or so try. I retreated with the 2 or 3 dribbles I had managed to capture. And so it went; a dribble here, a dribble there. Afternoon turned to evening. 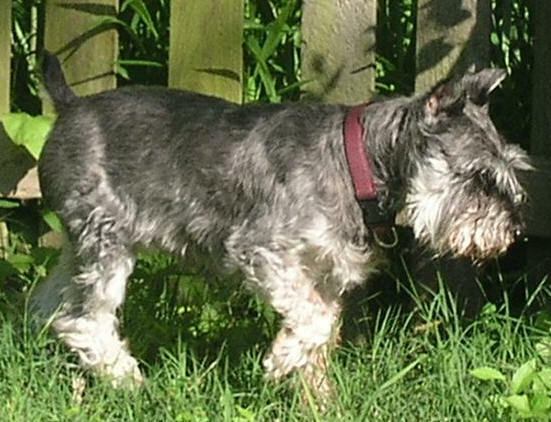 At which point, I had that realization of how ridiculous I must look, tailing my Schnauzer in mad circles around the yard with a Cool Whip container in my hand, wildly thrusting it beneath her each time she squatted, dutifully trying to obtain enough urine for the vet to test. Which I did, by the way. Proof that persistence does pay off. Those dribbles added up to enough to cover (barely) the bottom of the Pistachio nut container, which was just enough for the test. I didn't ask them to return the container. And the "Cool Whip Collection System" went in the trash. If only this would be the last time in my life I will look ridiculous! You know, I've been trying REALLY HARD to not RANT again about the way people drive. But it builds up and builds up until I feel as though I might explode if I don't rant. This is, after all, a relatively harmless way to release pressure. And it's been building for awhile. I hope you will forgive me while I digress! It's just that, driving isn't all that DIFFICULT...assuming a person uses some portion of their brain while they are piloting their vehicle down the road. If a person pays fairly good attention, recognizes they are not the only person in the world driving on a section of road, is halfway coordinated and uses a shred of courtesy, it can actually be fun. It doesn't have to cause your blood pressure to rise 30 points. It doesn't have to make you want to slap someone. It doesn't even have to make a person grumpy. So why do I frequently find myself fuming by the time I get where I'm going? On the way home tonight, I kept getting behind people going 30 mph. I tried to think of a reason so many unrelated car-loads of people were feeling the need to drive insanely slow on this particular day. It wasn't raining. It wasn't hard to see. In fact, it was a beautiful, clear, glorious kind of day (has been since the early morning rain blew out of the area). As I made my way through traffic, I finally found myself behind someone who was actually going 50 in a 45 mph zone...YES! But a quarter of a mile later, they were going 40 and they quickly dropped to 35 soon thereafter. Drats. Here we go again. But, as I decided I was going to have to pass ANOTHER person(them), they took off like a bat out of hell! What in the world was going on in their brain (I'm still trying to believe they had one - a brain, that is). I resumed a nice 50 mph pace, glad to be free of their annoying presence. It was but moments later when suddenly, I realized I was gaining on them rapidly...way too rapidly...which meant - YOU GOT IT - they were going 35 again! I wanted to scream a loud primal kind of scream!!! I did eventually maneuver around this lovely insane citizen, only to find myself trapped behind a beat up car and a pick up truck that had tires taller than my car. They were both going 30, side-by-side, as if they were out for an afternoon stroll together. Primal scream, primal scream, primal scream!!!! Next, I met another brainy driver who felt it was perfectly acceptable to turn left from the left hand lane of traffic in spite of the OBVIOUS FACT that there was a CENTER TURN LANE they COULD have pulled in so as not to cause everyone behind them to have to come to a screeching halt! SCREAM!!!! I lost track of the number of people who suddenly slowed, then veered crazily off the road, without using their turn indicator, naturally. I think the name kind of gives away the specific purpose of this interesting device. As in, it INDICATES you are going to make a TURN. Turn...indicator. Turn indicator. Get it? It's used so those behind you will know you are intentionally weaving madly across the road and that you aren't having a major heart attack while driving home. And speaking of veering, what IS it that makes staying on one's own side of the road so incredibly difficult????????? PRIMAL SCREAM!!!!! And why is it that the most annoying person you get stuck behind for the longest period of time always lives 5 houses down from you so you have to follow them almost to your own driveway before you can get away from them? I had two of those types in front of me when I turned into my neighborhood tonight...you know, the neighborhood that requires me to drive through an obstacle course to get in or out of the area? So, they are deftly maneuvering through this rather tedious course at a death defying speed of - 15 mph. Fifteen. One, five. I let the clutch out and coasted 3/4's of the way home. Except for the time the car directly in front of me suddenly swung over into the other lane. I braked cautiously (oh, wait, we were only going 15 so I probably didn't really need to brake). Then, they abruptly swung back to the right - ah, I see now. They are turning into their DRIVEWAY. Imagine that! And yes, the other car did "garage" about 5 houses before mine. It v-e-r-y s-l-o-w-l-y c-a-m-e t-o a s-t-o-p...at which point I finally realized they were PARKING in front of their house - a good foot from the curb. Man, was I EVER glad to FINALLY get home! Have you ever had poison ivy? I got it once when I was 25 or so years old (yes, that was many years ago, okay- so don't rub it in). I grew up in a part of the country where poison ivy was pretty much everywhere, and while I tried to keep a respectful distance, I had waded through plants that were waist high with nary an itch. That is, until the long ago day when I got it practically everywhere! Stupid. I thought I was immune. Lulled into a false sense of safety, I wound up with a horrid case after spending the afternoon pulling vines from trees. Since then, I have been known to go far out of my way...or to simply not go that direction at all...if poison ivy was anywhere near the path I needed to take. I have never again tempted fate. I'm careful where I walk if there is a chance P.I. could be lurking and I keep an eye on my back yard because of its proximity to the woods behind my house. Those woods just happen to be LOADED with the stuff, which may be why so many animals take refuge there. They know they are safe from humans and the ones who venture into their domain are going to pay for their stupidity. I like the privacy those woods offer, but I do watch for stray poison plants or vines that might be trying to take root in my yard. I want to kill them while they are small and easy to remove, when a good pair of gloves will offer me the protection I need to remain itch-free. When vines start growing over my back fence, I cut them back - BUT only after making sure they are "safe." This year, maybe because we have had a lot of rain, the vines are more lush than they have been in the past and I had several breaches that needed my attention. Most of the vines I encounter are those grape-leaf-looking kind that are totally harmless. About a week ago, I checked them out to make sure this was all I was dealing with, then began cutting and pulling them off the fence. I was making good progress. Feeling good about getting this project out of the way. I was clipping them down at the bottom and pulling, lifting away big sections at a time. UNTIL!!!!!!!!!!!!!!!!!!!!!!!! GASP!!!!! I couldn't believe it!! Poison ivy!!! It had camouflaged itself beneath one of those harmless vines and I was in it up to my arm pits!!!! After the third day, I began to feel better. There was no sign of those awful itchy bumps. What a relief! I decided I had escaped dreaded effects of the poison ivy ambush. But I had declared victory too soon. Coming home from work the next day, I started to feel a really intense itch about a third of the way down on the bottom of my right arm. When I got home, I checked it out and sure enough, I knew I was doomed! DOOMED, I tell you! One massively sized bump that was very full of the dreadful poison elixir had risen at the center of itch "ground zero." I searched the house for anything that promised to help relieve the itch and dry it up. Nothing. So I carefully washed the area (the hot water was HEAVENLY) then cleaned with alcohol and put a Band-Aid over it in hopes of preventing scratching during the night. The next morning as I prepared to go to work, I peaked beneath the bandage to see how it was doing in there. The itch was intense! I kept telling myself that I was lucky...it's only one bump...AND HOW IN THE HECK CAN ONE STUPID BUMP ITCH SO MUCH!!!!!!!!! By the time I pulled out of the driveway, I was thinking about how nice it would be to take some sand paper to it. That one bump got really big. It's been red and swollen and ITCHY for over a week. It did start oozing poison a few days ago, so I put a huge padded Band-Aid over it to contain the poisonous clear liquid. I hoped this marked the beginning of the end. But when I got up this morning, it seemed like the itching was even worse and my arm bore a larger red and inflamed circle than it had when I went to bed. In spite of my tenacious and unrelenting resistance to scratching the daylights out of it and carefully containing any oozing poison, it was starting to SPREAD! I'm sure everyone has been anxiously awaiting an update on my poison ivy, right? Well, I'm happy to tell you it is ALMOST gone. I guess I am a little amazed at how long it is taking to heal, but at least the itching is now at a tolerable level. I had forgotten how nice it is not to itch madly! Trying to ignore it does use up a lot of energy! I was invited to a friend's house tonight. They were having a group of people over and I saw some people I hadn't seen for quite awhile. It was a very pleasant get-together and it was nice to see everyone. But I noticed again how very odd I feel doing things like this now that I'm a dumped divorcee. I feel so out of place, awkward and alone, even in the midst of my friends. It's so disconcerting! Or maybe it's just that I feel strange and altered because so many things have changed drastically in my life. I don't see things the way I used to and I don't feel the way I used to feel. It's kind of like having poison ivy in my heart and soul. It's pretty hard to ignore and impossible to act unaffected. The disruption isn't something I can hide from myself or ignore, so I find myself feeling very empty and alone. Anything I say tonight is certainly going to be more rambling than thoughts. I think I have sunk to a new level of "brain-deadness." I know the current environment in most businesses requires a person to do more (MUCH more) with less (MUCH less) and I am willing to give it everything I have. I want the company to be successful and I want all of us to win! In the past, my workload has been such that I had to tear myself away from something gravely important to go to the bathroom...there was never a good time and there weren't any breaks in the hectic pace. Lately, the load has quadrupled and I'm barely surviving!! I'm going and doing and juggling as hard and fast as I can. But I feel as if there are bullets coming at me from so many directions, I can't duck fast enough and I can't accomplish enough to get people to stop shooting at me! All of this isn't because of our local management. We have a wonderful president who has his heart and soul fully engaged in helping us to be successful. But people far removed from the reality of what it takes daily to get things done make decisions that make it nearly impossible for us to succeed. It's discouraging. And sometimes, like tonight, I'm so tired, I wonder if this isn't killing me (as in torturing me to death). Is it like this everywhere? Are there places where companies are run with both short AND long term strategies in place? Are there companies that are well run, that aren't killing their employees with the workload and where good ethical decisions are being made? Where logic is used and impact is carefully considered? Where the executives in the upper ranks aren't cut-throat two-faced devious back-stabbers who are only out to make themselves look good at the expense of everyone else? Where politics aren't choking the business to death? If so, could they use a really good HR manager..? They fired my boss yesterday. The one who was giving everything he had to give, who put his heart and soul into the business, who cared about the people and wanted us to succeed. Instead of giving us the help and resources we needed, they let him go because he wasn't making enough of a profit for the company fast enough to satisfy the powers that be. I am sick. The one really good thing in my life was being able to work for a person who is ethical, intelligent, diligent and business-savvy, but who is also a warm, funny, caring person. He and his wife will always be dear to me and the friendship will endure. But it seems like a great darkness has come over yet another area of my world. It's hard to remain optimistic in such conditions. Life, once again, seems fragile and empty.